These stunning earrings feature 7x5mm genuine, simulated, or created gemstones delightfully set into highly polished sterling silver and are adorned with a sparkling halo white topaz border. These elegant and unique earrings are crafted of sterling silver and are secured by lever-backs. 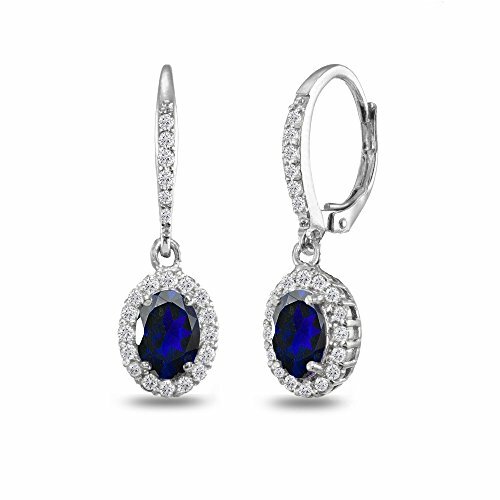 FEATURE - These stunning earrings feature 7x5mm created blue sapphire gemstones delightfully set into highly polished sterling silver and are adorned with a sparkling halo white topaz border. CRAFTED - These earrings are crafted of 925 sterling silver and are nickel & tarnish free. They are secured by lever-backs.